MV Sundarban is a 300’ by 50’ and 3-storey behemoth with a coronary care unit (CCU) and a lift. Yes, you’re listening rightly! MV Sundarban-10 is the most luxurious and largest launch in Bangladesh operating in Dhaka to Barishal road – it’s Sundarban-10. It was opened on 25th June, last year and becomes huge popular into the people of this route. Its CCU provides safe and secure journey of the critically-ill person. It runs with the Sundarban Navigation Company. It’s a 16000 square foot launch was built with a German engine in the local shipyard. It took more than three years to complete its construction and it can carry 1300 people at a time with a food court, VIP, business class cabins. It’s equipped with global positioning system, radar and an electro hydraulic system. According to its owner, the vessel is able to navigate in the foggy weather. 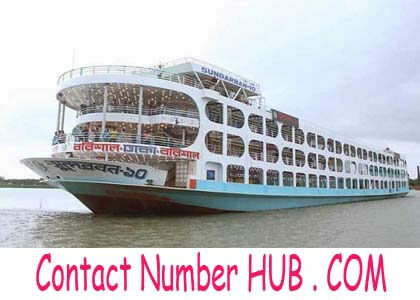 MV Sundarban-10 is the largest and famous launch in Bangladesh with various advantages that are described above. They provide their services mainly to the route of Dhaka – Barishal – Dhaka. It offers a safe and joyful journey for the passengers, maintaining the accurate time and schedule. But, most of the passengers traveling to MV Sundarban-10 Launch are unknown of their service details and contact information. This content will make sure to know all details, including counter numbers, ticket prices and other important information. MV Sundarban-10 starts its journey at 8:30PM from Sadarghat Launch Terminal, Dhaka and arrives in Barishal at 4:00 AM of the next day. Similarly, starts from Barishal at 8:30 PM and arrives in Dhaka Sadarghat at 4:00AM on the next day. In this concern, passengers can get details about their time, schedule and other information with their contact numbers. Here are the contact numbers of some other launches operating in the Dhaka – Barishal – Dhaka Route. People who like to visit this home district or the nearest ones can take their services. MV Parabat-2: Departs at Night 8:15. MV Parabat-7: Departs at Night 8:30. MV Sundarban-8: Departs at Night 8:30. MV Parabat-9: Departs at Night 8:45. MV Surabhi-8: Departs at Night 8:45. MV Surabhi-7: Departs at Night 9:00. MV Sundarban-7: Departs at Night 9:00. MV Parabat-11: Departs at Night 9:00. MV Sundarban is a modern launch service and updated than all other service providers in this sector. They offer various extra services for the passengers, including free Wi-Fi, Critical Care Unit (CCU) and many more.